Acute exacerbation of chronic obstructive pulmonary disease (COPD) is a clinical diagnosis that is based on changes in dyspnea, cough, and/or sputum production in a COPD patient; however, patients presenting with an acute exacerbation may be undiagnosed or have a variety of comorbid conditions that can complicate diagnosis. 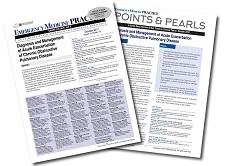 This issue presents strategies and algorithms for the early use of evidence-based interventions, including appropriate use of antibiotics, bronchodilators, and corticosteroids, along with noninvasive ventilation with capnography, to minimize morbidity and mortality associated with this disease. It is change of shift, and you receive sign-out on a 67-year-old gentleman with a history of COPD presenting with 5 days of worsening productive cough, wheezing, and increased albuterol use despite outpatient treatment with prednisone and doxycycline. His oxygen saturation was 86% on arrival, and the nurse placed him on oxygen therapy at 6 L/min via nasal cannula shortly before you arrived. You find the patient sitting on the edge of his bed, tachypneic, with increased work of breathing and audible wheezing on auscultation. He is alert and acknowledges your presence but does not speak. You wonder why he continues to be hypoxic and if there is any other intervention that is indicated . . . 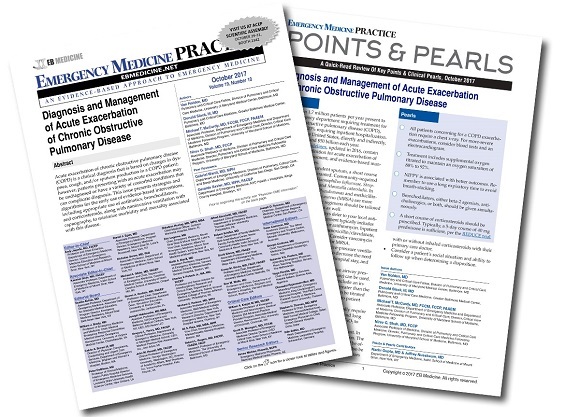 Excellent recommendations of a common ED malady; love the Risk Management pearls in the issue.